For much of the summer, patches of orange-red Eriosema can be seen in our grasslands right up into the ‘Berg. Cattle don’t like eating them, so they are common even in over grazed areas. The trailing stems cover rocks and the flowers are held above the leaves on short hairy stems. Large, rough leaves are tri-foliate and have prominent veins underneath. Eriosema is member of the legume family which means the fruits are pods. 36 species occur in South Africa, with four in the KZN Midlands. In common with many of our grassland plants, Eriosema have a large, woody underground root system – up to 5m. Only one in six plant species in grassland is actually a grass, with most of the perennial plants living for many years - re-sprouting annually, rather than seeding. This means that transformation of grassland by ploughing is irreversible. In Zulu medicine, decoctions from pounded, boiled roots are used for urinary ailments. 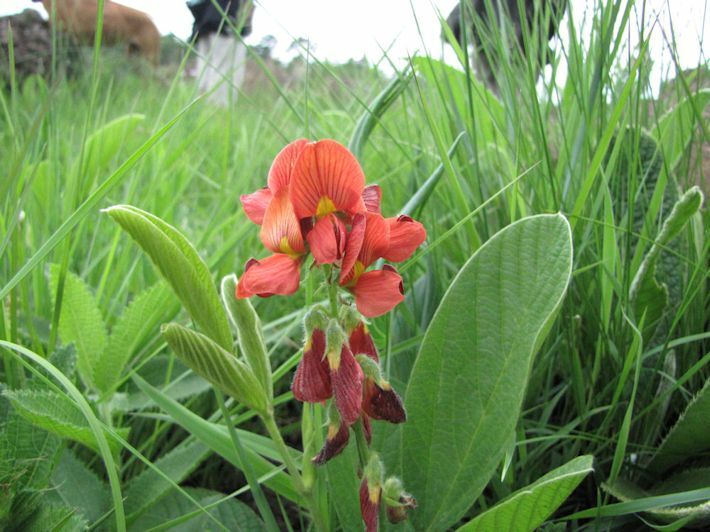 Eriosema is common on Beacon Hill, Bill Barnes Reserve, Gartmore and in the Mpophomeni hills– why not join one of the regular walks and see them for yourself? See www.midlandsconservancies.org.za for details.